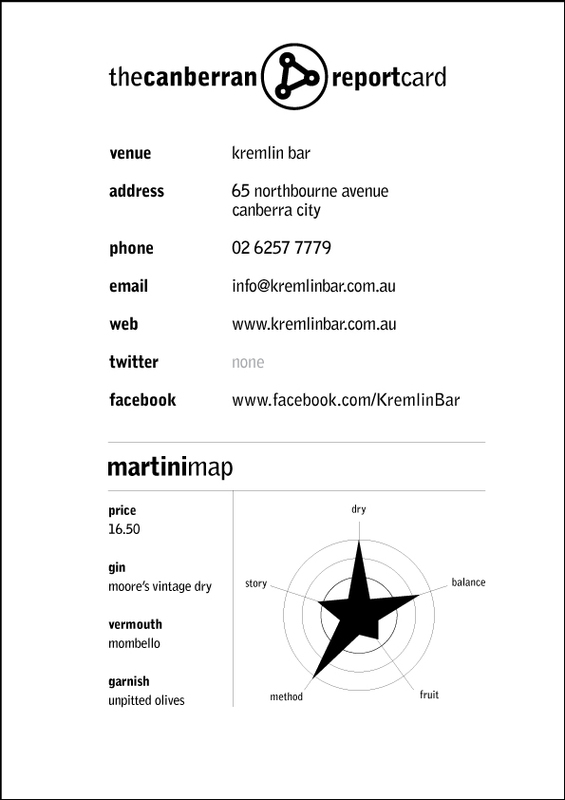 At the 2012 ACT Australian Hospitality Association awards night, Kremlin Bar came out on top of the cocktail category. While this may have raised a few eyebrows around town there is no argument this City Centre venue has been a consistent performer in recent years. What we wanted to know of the Cocktail Bar of the Year was simple: In a world of infusions, flowers and flourishes, could the Kremlin Bar make a simple martini? We arrived on a quiet Thursday afternoon, shortly after 5.00pm. We had the place to ourselves, and as such were able to comfortably engage the bartender to undertake our quest. He was obviously attentive, preferring conversation to polishing wine glasses. Accepting our challenge of the Kremlin Bar martini, we discovered his name was Duncan. We’d love to have a martini with Duncan. Duncan began with a gentle flair – fluid but not showy – and smoothly deposited the martini glass on the bar. Immediately this was filled with ice. Once set, his attention returns to us. “Today were going to keep away from the aromatics.” Without further ado a bottle of Hendricks appears and lands confidently on the bar. Reaching to the shelf behind him, another bottle is retrieved and dropped alongside the gin. “This is something you’ll find interesting…” We squint to read the label. It’s Mumbello vermouth. To be honest, we’ve never heard of it, and enquire as to its origin. Duncan smiles; “Cook shops.” A few well measured nips land in a shaker filled with ice. We laugh, picturing in our minds the exotic streets of the Belconnen suburb and all the refinement of the local IGA as Duncan pours a splash over the iced glass. He decides to fill us in. “I hadn’t seen it before, but it works really well. Clearly it’s Italian.” We have a look at the label and see it is indeed from Piedmont, the traditional home of vermouth. A quick whiff from the neck of the bottle reveals it to be slightly sweeter than Noilly Pratt, but only just. “As a martini fan myself, I like the subtle difference the Mombello brings to a well made classic.” By this stage the ice had done its job, and with a flourish the ice lands in the sink. Before placing the glass back on the bar Duncan uses a cocktail napkin to remove the condensation from the exterior of the vessel. It’s a move we’ve not noticed before, and shows a lovely attention to detail. Retreating to the nearby bench to leave Duncan to his polishing we contemplate the drink before us. The highlight is the 20 cent piece-sized pool of olive oil floating on the surface. It looks absolutely delicious, so we decide to dig in. Yep. 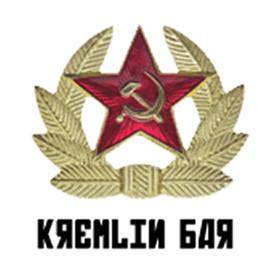 Kremlin Bar can certainly make a martini.